For those of you that are new to the Army Officers’ Mess in Ottawa, or those of you that have never ventured upstairs to the den of the Gunners, I bid you welcome to the Observation Post de Hart. The pages that follow will only give you a brief insight into the memories that are on display. To find the deeper truth, one needs to engage in conversation with the Gunners that were here when the mementos were presented. Hopefully, I can encourage some of them to share their stories by return email. Once we get the website established. In the meantime, my limited knowledge will have to suffice. above. 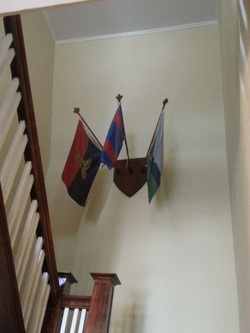 The Royal Canadian Artillery, the Royal Canadian Engineers and the Royal Canadian Corps of Signals all have their homes located on the top floor. The Engineers have just had their area renovated into an upscale conference room. Of course, a bar would be inappropriate for a conference room, so the Sappers will have to come down the hall to pour a cold one with the Gunners and Jimmies. At the end of the hall, above the door we have a carved, wooden artillery badge. It was presented to OP de Hart by Colonel B. Shapiro, O St J., CD on 27 May 1994. 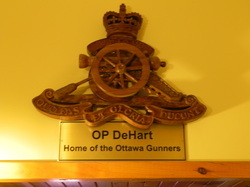 The metal plaque underneath the crest was installed in February 2014 and marks the OP as the Home of the Ottawa Gunners.